We are drowning in information but starved for knowledge. Knowledge is not a commodity. It is not a fungible product that can be stored in some ice house until the right moment. To really look at the power of knowledge, we need to think of it as a service. Its impact and value really only come into being when the right information, context, insight and opinion come together at the right moment for a decision to be made. It is quite an ornate bit of choreography that goes into it. The key is to create a process, a flow of knowledge that connects these elements in a more regular basis allows. The heart of Pandexio is the 3-column dashboard. It is an app and service designed to help you create that flow of knowledge. Projects and documents get shared with team members in the first column. When you're ready to start the flow of knowledge, you launch a document in the viewer. The Pandexio Viewer lets you collect, describe, connect and organize your knowledge as you read, and frees your newly minted knowledge from the container of the document. 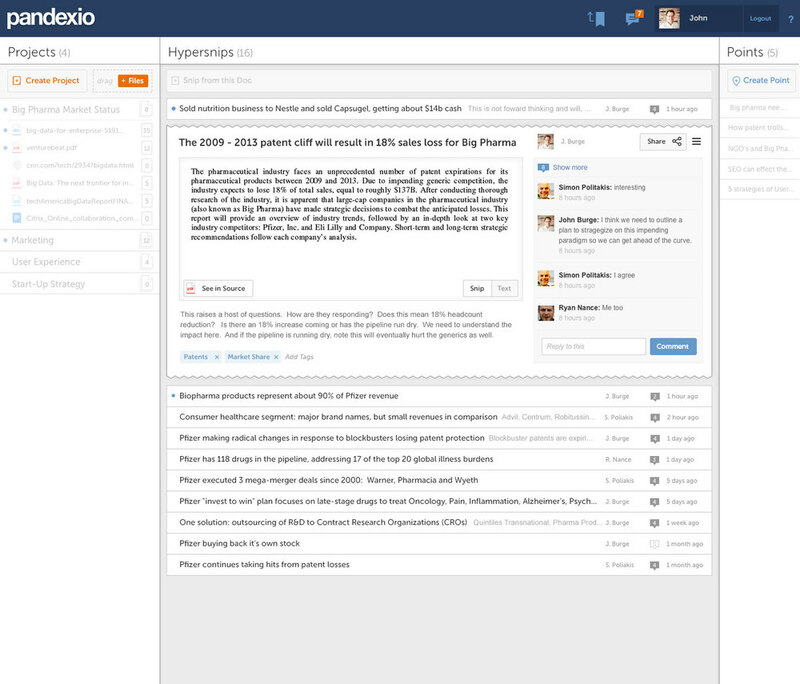 At Pandexio's core is the Hypersnip: a connected and easy way to mark, collect and manage salient information, statistics, quotes and ideas from documents, charts, pages, images and more, all without losing context. Each hypersnip is added to a universal snip feed with all the other hypersnips from all the other documents in your project. This means it is much more than a note taking tool; it's a way to pull your finds out of their sources without breaking the connection. Collecting and organizing your information and facts into Hypersnips of knowledge is a key step in formulating your ideas, in articulating your point. Creating a hyperpoint is the next step. The Hyperpoint is deceptively simple: just paragraph text or one-level list structure but it connects your assertions to your knowledge in a seamless and fluid way that doesn't interrupt the clarity of your ideas, simply lends them impact. And when you view your Pandexio on your mobile phone, you have all of that knowledge, all of those hypersnips and hyperpoints with you, connecting your knowledge to where and how you work. Copyright 2018 Pandexio, Inc.. Pandexio, Smartsnips, Hyperpoints and Curated Insights are Trademarks of Pandexio, Inc.